Put seven women together and I had expected a cat fight. Luckily, Never Dance Alone chose a different path. It turned out to be an entertaining and heartfelt series. For older viewers, it was a nice trip down memory lane. Watching this series with my parents, they could not help but share memories from their school days. Alan Tam’s songs were artfully used to enhance the feeling of nostalgia. But viewers of all ages will find that they can resonate with the messages about friendship and dreams. The series was thoughtful in its examination of friendship and inspiring in its message to pursue your dreams. The drama juxtaposes scenes from the past and present. I like the interconnections between the two time frames, with the parallels between the two generations of artistes. The casting of the young actresses was done well. They all bare resemblance to their older versions. Their acting is better than most new artistes and they exhibit a youthful energy. They were given ample screen-time, which unfortunately meant less time for the veterans. Carman Lee was phenomenal. Never have I been so entranced by a performance. It is hard to look away from her whenever she is on-screen. Her every expression, every movement, every line delivered was perfect. Her chemistry with her on-screen husband, Lawrence Cheng, was impeccable. Not to mention her stunning beauty regardless of whatever her real age might be. Flora Chan turned in an excellent performance as well. She carried herself with the arrogant manner of her character. Yet at the same time, she was able to make her character one that the audience would sympathize instead of hate. And her dancing was spectacular. The other actresses also left memorable impressions with their characters. Each of them fully embodied their characters and acted in their roles without restraint. The bond between the ladies feels genuine and deep, as if they really have known each other for 20 years. I have not seen most of these actresses before and I am truly wowed by their talent. The series is rounded off with good performances from the supporting cast. Lawrence Ng shows off his comedic side, a big difference from his normally professional image. Lawrence Cheng plays his typical loving husband role, but as I said, his chemistry with Carman was remarkable. Miu Kam Fung was superb as the mean mother-in-law. Special mention to the maid Daisy who was seriously hilarious. Even Eliza Sam has improved to the point that her acting and accent does not bother me here. It was great to see the guest stars too, including Eric Tsang himself! Carman Lee better win something this year for that amazing performance! Take both favorite character and best actress like Kristal did last year! phenomenal!!!!!!!!! No I find her role was great but acting can be improved cause she hasn’t been filming for long time. But I did really like Folra cause she play her role great. If she is nominate for Best Actress of 2014 TVB Anniversary. She might have a chance. Maybe if tvb play fair. Hopefully TVB will continue to produce quality series like this one! I hope so too! It’s been years since she’s acted with TVB and she still has it. She nailed her emotional scenes and really connects with the audience. Hope she wins at least something! I’m like wtf 5 stars? Out all the other dramas they give this 5 stars and the other ones 2 to 4 stars. Never heard of Carman Lee, was she ever very popular? Somehow i never like her looks, she reminds me too much of Tracy Huang. I find this drama very confusing due to too many characters. Very tedious to follow. She was from the previous generation. Quite popular, in leading roles, can already act but now she can act even better. Carmen Lee is in more Mainland series than Hong Kong. The series she did in Hong Kong is TVB 神鵰俠侶 Return of the Condor Heroes 1995 with Louis Koo. Another tvb series is demigods semi devils 天龍八部 1996. Other Hong Kong works she did is mostly movies. Eric Tsang’s appearance was unnecessary and added nothing to the story except he was acting like a jerk. Should have been Alan Tam. Or all members of Wynners. By the way Carmen Lee for TV Queen. A close second, Flora Chan. Her dancing alone deserves an award. No Eric was funny when he came in but they should have really put Alan in the series when they got the autograph. Or come and sing a song live to Cindy. Goes to show no matter how much connection Eric has, he still cannot manage to get Alan Tam to come for a brief cameo. Good script and acting from the older as well as the younger generation. I like the chemistry that they share. I’m still having a withdrawal despite that the series have ended for almost 2 weeks now. M Club is definitely one of the better series in recent years. I love the drama and truely one those i will re-watch again. I love the casts and story! Great review. I love this series. I was laughing & crying at the same time. Wish it was longer. Definitely should win dramas of the year! I’m hoping for Carmen Lee for best actress in TVB awards as well. she is the front runner so far. if not at least my favorite character. Wow,I am shocked but also happy to hear such great comments from everyone regarding this series. I remember before when it was just being announced how everyone was saying how bad it will be and calling of the leading ladies old,etc… I guess it shows that we should not always judge a series or anything too early because it often times ends up being the opposite if what we expect. It is good to not have too high of expectations as well because when we do, things do not meet those expectations so we can get disappointed. I think this is a series where everyone can act including the new actresses. In other TVB series there will always be one or two who will annoy you with their sh177y acting. 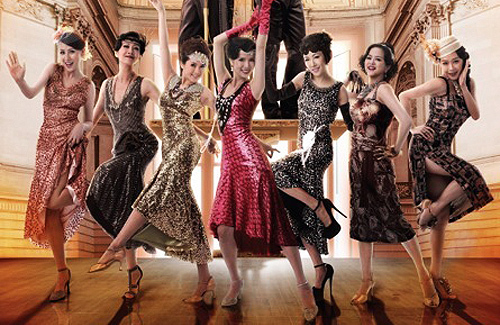 I accompany my mom to watch this and it’s pretty good and the younger actresses are all pretty. I like Flora Chan in here, she dances very good at her age. Those who watch this drama saw the ending competition between M-Club and Flora know what I’m talking about. She can dance fast and good!! Good job Flora, you great for your age! ANd regarding Carman’s age, she definately in her late 40’s, NOT in her early 40’s like how wiki said, LOL! Here is the timeline of her acting career. Fact: Carman was an air-hostess before she enter the entertainment. We all know she can’t be 18 when she was Air-hostess of Cathay Pacific, flight attendant have training too, and unlikely airlines hire girls who are in their “teenage” years. So the movie director did not meet her on the flight at that young age. Carman’s filmography up to the year 1995 when she start doing TVB drama ROCH. Her first movie role was in the year 1990, that is the same year the director meet her on the flight and introduce her to acting. There was a 5 years timeline gap between 1990 to 1995 when she did ROCH drama with Louis Koo, so add 5 more years to her age. So this news article that said she 47 year olds is right. Hope Eric will do a 2nd season rather then a movie. Normally movie will fail, just look @ Laughing Gor’s movie version. i enjoyed this drama but would have probably given this 4 stars as the casting of lawrence ruined it for me. he was so boring, i would skip his scenes alone and the ones with flora in them. their relationship was a drag. and i agree eric’s cameo in this was pointless and not funny at all. they should have used him as a judge in the dance show or something. and alan definitely should’ve made an appearance. otherwise, what’s the point of having him as the girls’ idol. might as well have been leslie. Which Lawrence are you referring to? Really? He was not that bad was he? I have seen him in many series and his acting isn’t bad. But of course whether anyone’s acting is bad or good is down to a matter of opinion I guess. 5 Stars is little too much. It was ok, above average. More like 3.5 stars at least. Its a bit better quality. I just don’t think it will turn into a movie. Why do you think it only gets 3.5 stars? It’s amazing show. Thanks to Producer Eric Tsang & all the Cast Members did a great job. The acting in this series with new and old talent is so much better than the current active popular TVB actors. Definately deserve 5 stars ! Acting wise, I like the new actresses – I’m glad tvb gave it a shot with freshfaced newbies. There’s a certain chemistry about the girls that makes it seem like ur really watching a bunch of real girlfriends hang out. The older actresses did a good job too, esp Carman. All in all, a great production – I hope we can get a sequel or movie! !